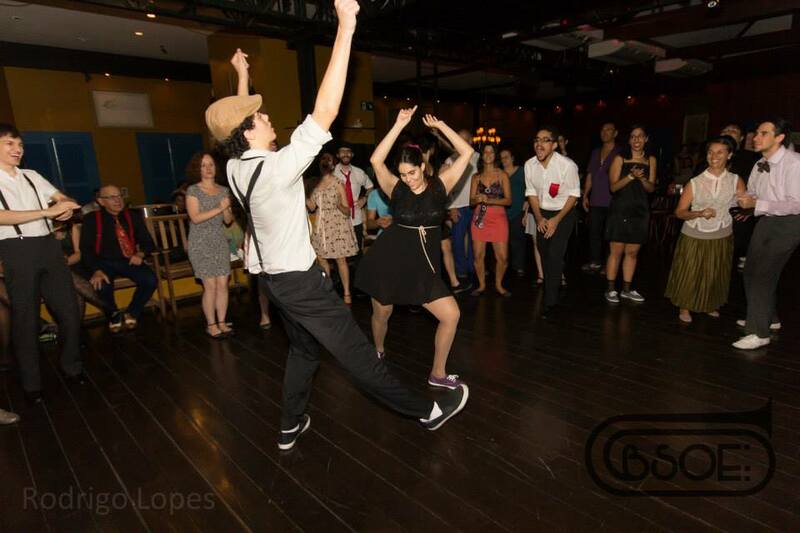 Dario taught a swing dance classes in Parque las Tejas/ Tiles park. 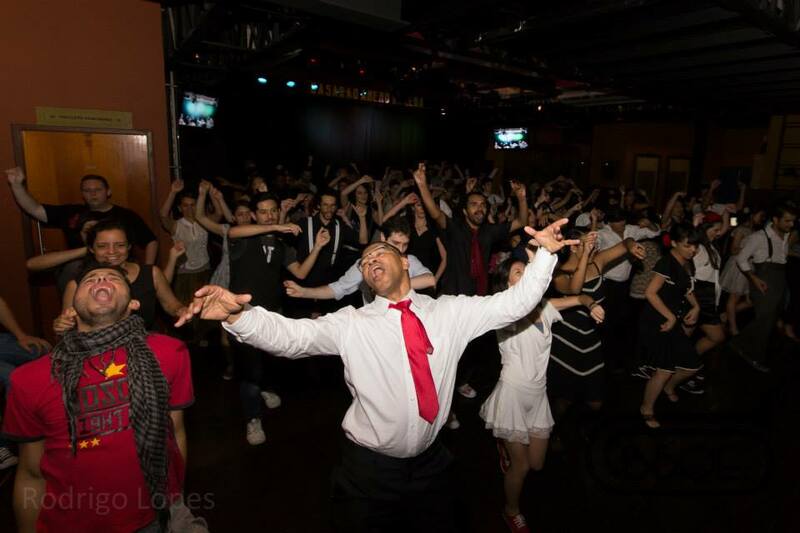 Despite now living in Buenos Aires, he’s sowing small seeds and nurturing a swing dance community in his home city of Cordoba. Some of those in the class are hip hop and house dance enthusiasts as well as Dai Zapata, an experienced Cordobes tap dancer. As it was Dario’s last night we had to commemorate the occasion with a dance under the white bridge with the Christmas tree of lights in the distance. Although barely audible we’re dancing to ‘Wham’ by The Hot Sugar Band. For the full story see my last post and Version 1 of my Sao Paulo jig to ‘Ask’ by The Smiths. Morrissey expresses the experience of Shyness better than I can. It’s through Lindy hop that I jumped this social hurdle; bounding around a foreign cityscape is all part of exorcising my sweet yet sometimes debilitating demon. During my short stay in Sao Paulo I buddied up with Adriana. She lives in uber-central Republica in a cool 1940s apartment that’s barely changed since that era. We both admire vintage flavour. I was her Couchsurf guest and boy, what a wonderful host she was. She teaches film and script writing at the local universade. The university is in the Japanese community quarter, Liberade. The Sao Paulo sunshine was shining on me as Adriana agreed to be my camera woman for 2 days. The pair of us sauntered around the city talking over our favourite locations – her as a local and me as a visitor with my first impressions. Adriana and me hanging about the city. At the end of Sabado, although completely pooped we dragged our sorry bodies out into the night and bopped until the early hours at The Clock Rockabilly Club. I had an ball! 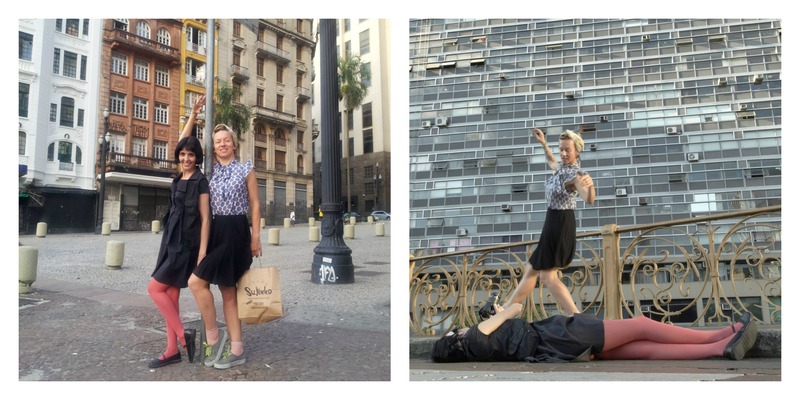 The Sao Paulo cityscape although gritty and tough was a feast for the imagination and we took loads of footage! So I’ve edited this wedge into 2 versions. Version 1 is above – version 2 is on it’s way! Ask me – I won’t say ‘no’ – how could I? Nature is a language – can’t you read? Oh, la la la la laaaaaa la…! Now let me tell you a colourful tale…. 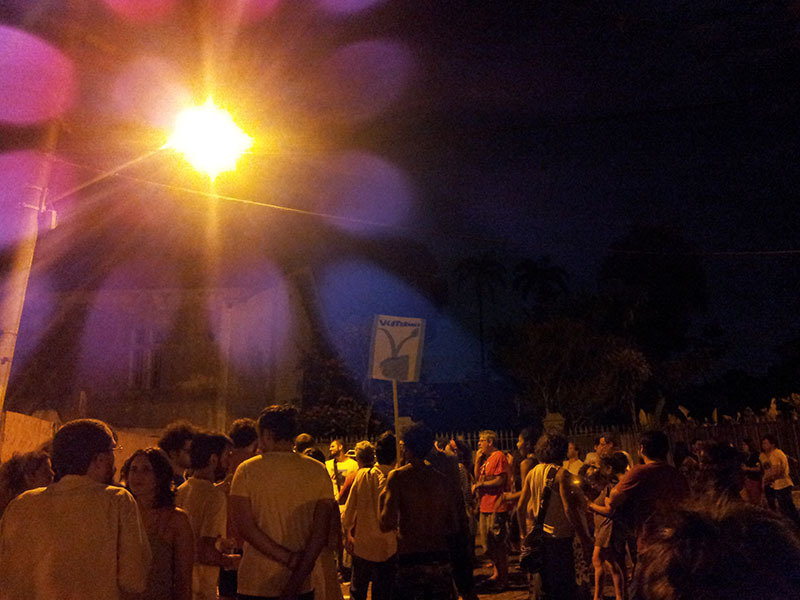 On the eve of Carnaval the call of relentless drumming echos all around. 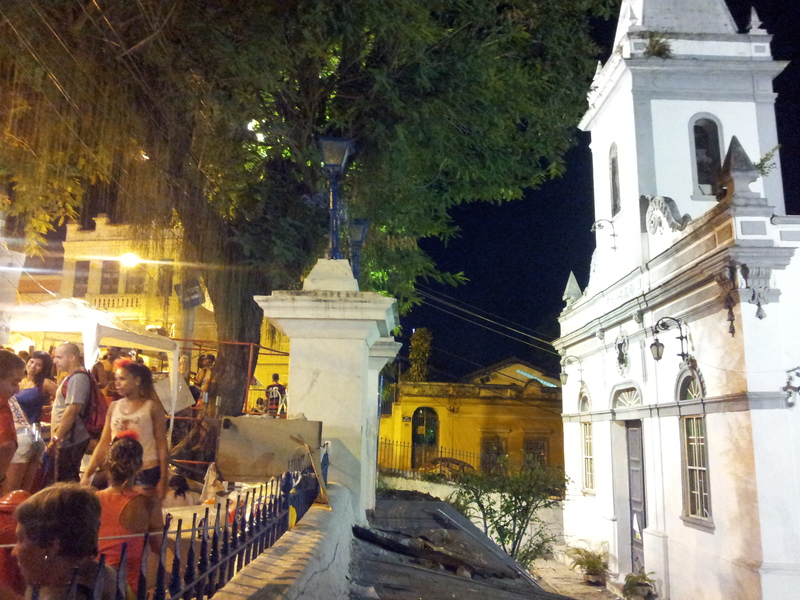 I’m staying in Santa Teresa, a maze of cobbled streets perched on a hill overlooking Lapa and Centro. 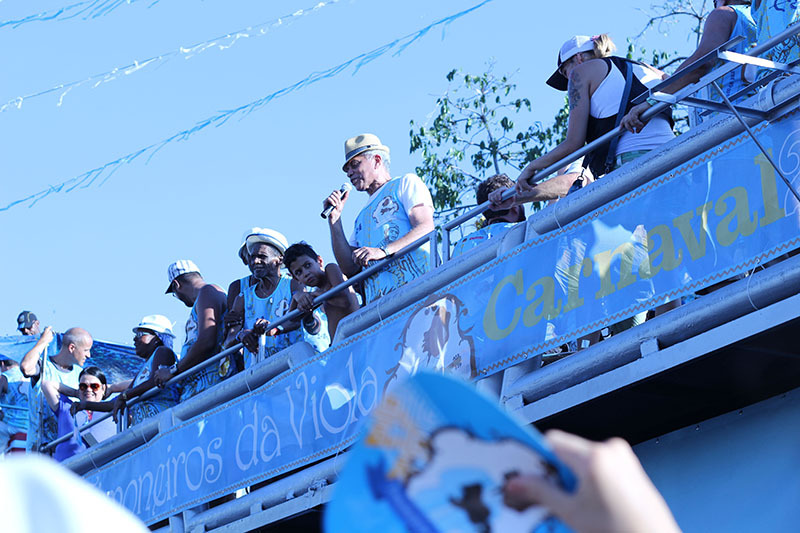 The view from this part of the city is great – helicopters, jumbo jets and birds from the Tijuca park cruise across the panorama of blue sky day in day out. And, in memory of Raiders of the Lost Ark, a rhythmic cacophony rises up. It’s like you’re being summoned. There’s a great feeling of ritual. Submission. A call to abandon yourself to the season of madness. It’s Thursday night and I pop along to L’Argos des Neves. (literally: Square of the Snows, from the Catholic Maria of the Snows). The beautiful unused church at L’Argo des Neves, surrounded by merry makers on the eve of Carnaval week. Left – The ‘bonde’ (tram) rails lead us home with the pretty church a-glow in the background. Right: I loved this woman’s head dress. It was the first of many ambitiously crafted that I was to see. A gang of us make-up, mask-up, dress-up and walk fifteen minutes to Praca Gomez for the Carmelitas bloco. It’s thrilling. 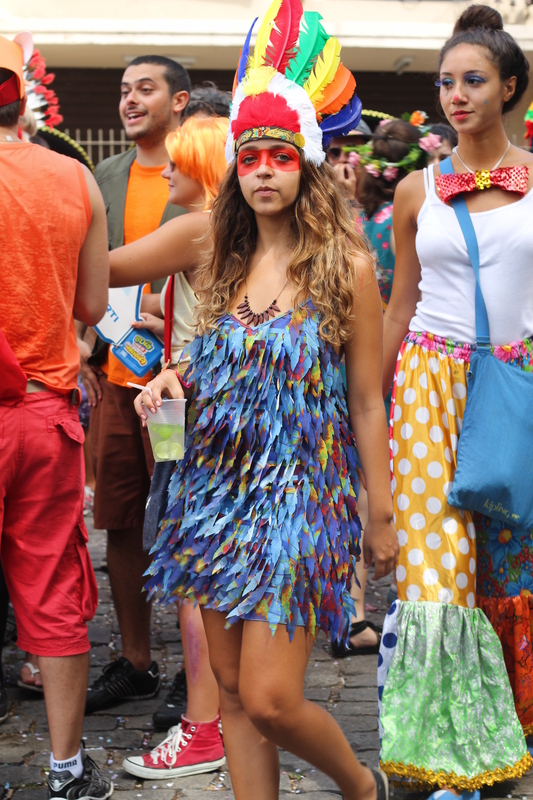 The streets are heaving with the colourful joyus rabble. It’s impossible to resist this affectionate wave of energy and camaraderie. Essential pre-bloco warm up exercises! Juan and I agree to rise early and catch another local bloco, Ciel na Terra. We’re there at 8am and the gorged parade is already in full swing as it actually started at 6am. Okay, so I’m becoming accustomed by now to the Wonder Women, the men dressed as Nurses, Mario Brothers, all round eclectic fancy dress. BUT! then come the huge puppets and banners, floating along above the umpteen people beneath – WOWee!! Trumpets sound, chants are called. My bottom lip begins to quiver, my face rushes with sensation, I start to weep! This is overwhelming and wonderful! I’m across the globe from my sleepy rural home in ye olde labyrinthine Santa Teresa; it’s early morning and all these people are absolutely fully committed to looking incredible, coming together, finding an instrument and playing it, hearing a rhythm and dancing to it, seeing a face and kissing it. This IS the pyschedelic storm I anticipated! Oh, how I love all this pagan wierdness! Never has there been a better reason to get up early and party. This bonanza of colour and delirium was a pleasurable sight for sore eyes. 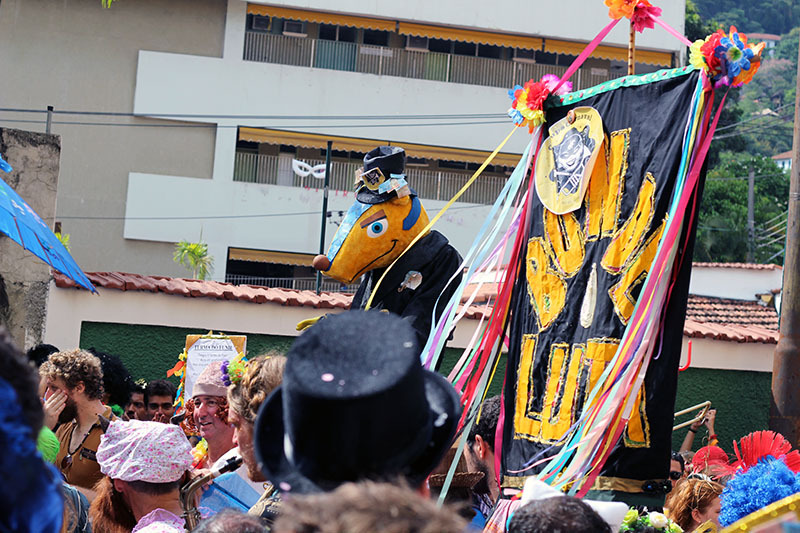 The banners – the puppets – wonderful! 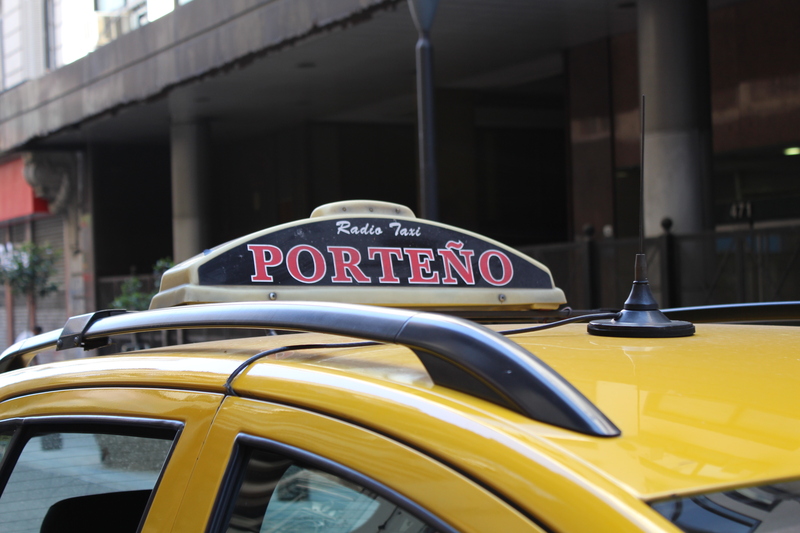 ‘Bonde Luta’ – Tram Stolen. By the time I arrived in Rio the quaint old yellow tram of Santa Teresa has been pulled out of action as a result of safety issues. Signs of protest against this decision are all around the neighbourhood. 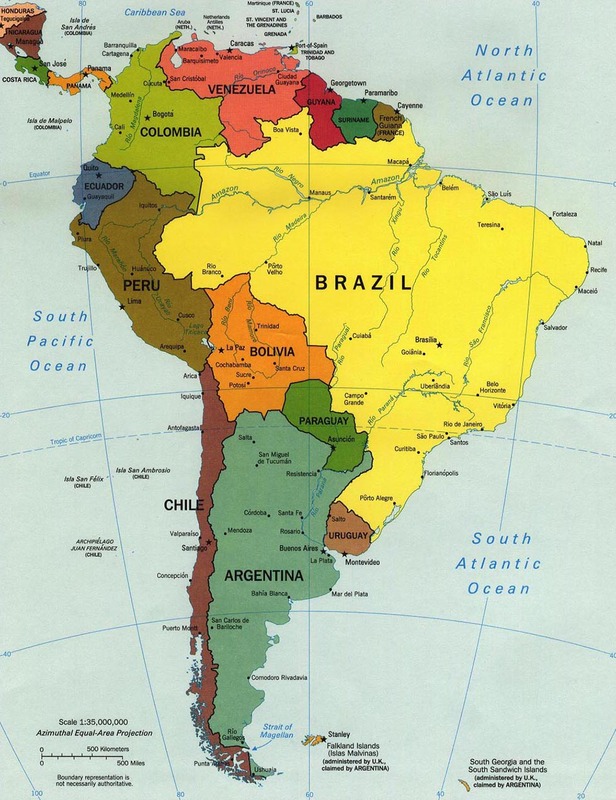 It’s presence is missed and the World Cup is held partly to blame for it’s neglect. Word on the street is that the hoe-down at Praca XV is gonna be good today. A bunch of us head down and catch the last of it. We perk ourselves up with salgados and acai to the terrific sound of drums around us. 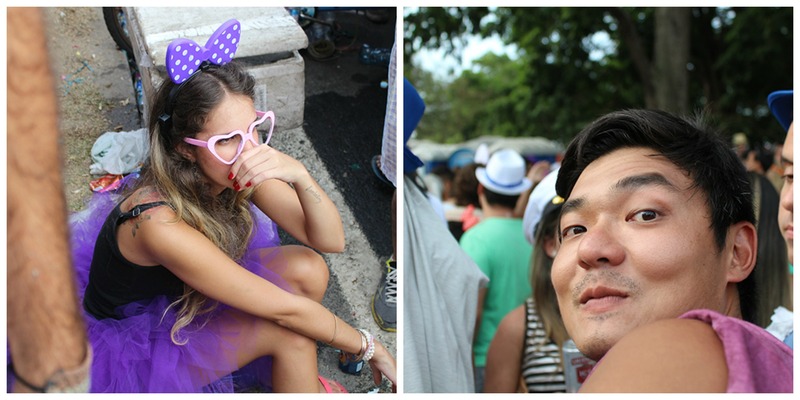 I bump into Marisa and leave my hungover friends to go with her to Praca Tridadentes where another bloco is underway. The walk across this central business district is an event in itself. There are few cars around, lone skyscrapers stand. 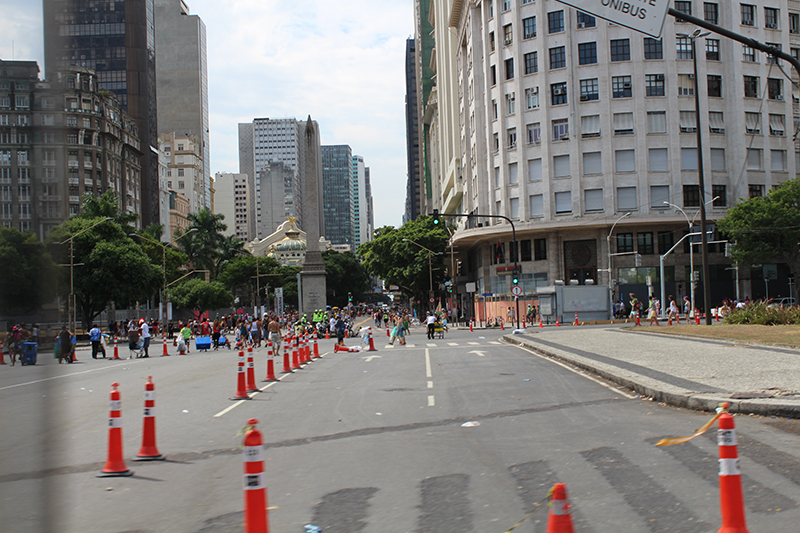 Crazed packs of Carnavalistas occupy the streets. I’m reminded of one of my favourite zombie films ‘28 Days Later’ where London is deserted. The universal ´we´ are all walking in the same direction teasing, chasing, playing with each other, marching on to the next sound cloud somewhere in the distance. Vendors selling popcorn, hotdogs, coconut water are here and there. Stood by their barrows, they too are happy! The Afrika Folk Pop dancers are busting out some great moves. I’ve seen them around the city in the weeks leading up to this, busking around the city. Afrika Folk Pop Dancers – near Praca Tiradentes, Rio de Janeiro from Dusty Sioux on Vimeo. 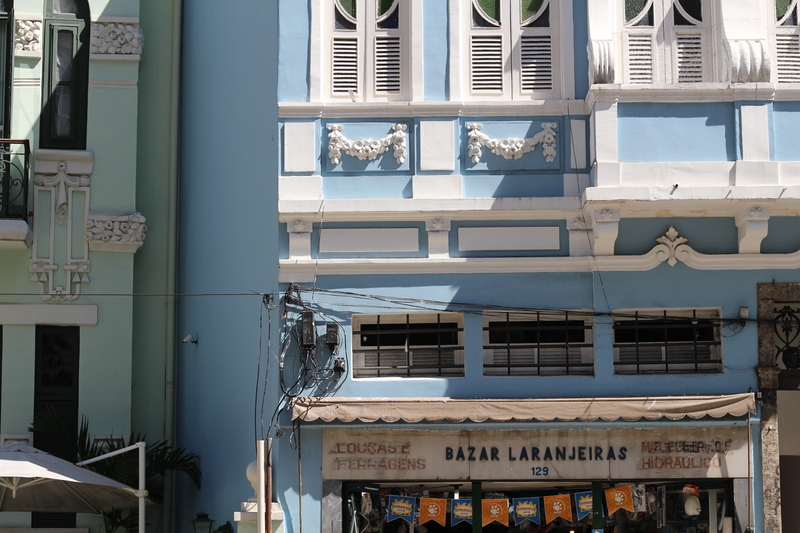 The quiet yet crazed streets of central Rio. A man who could do the splits – a plump wonder woman – smiley girls in wigs – a VERY rude priest! – pink ladyboys – and some excellent drag. 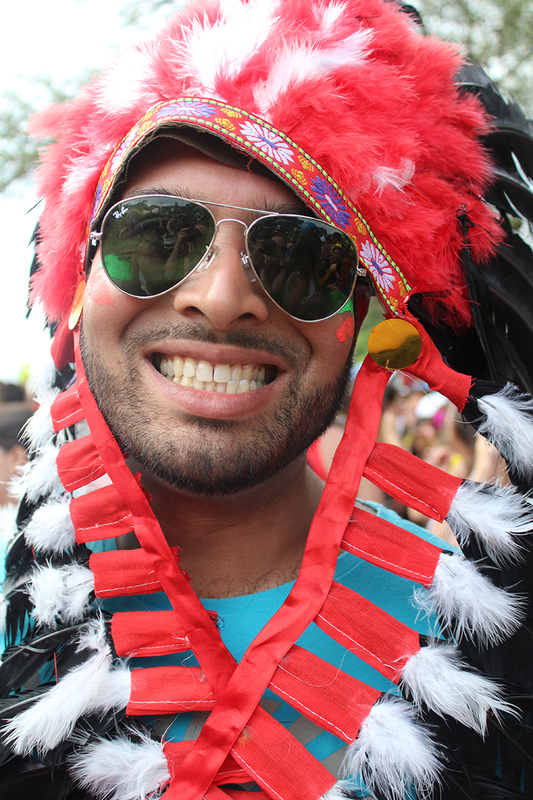 More beauty: a gallant pink indian. Lovely legs rest on a taxi. A man wearing a camel – Happy Chappy – Pirates at the bus station. There’s a bloco at Flamengo today. 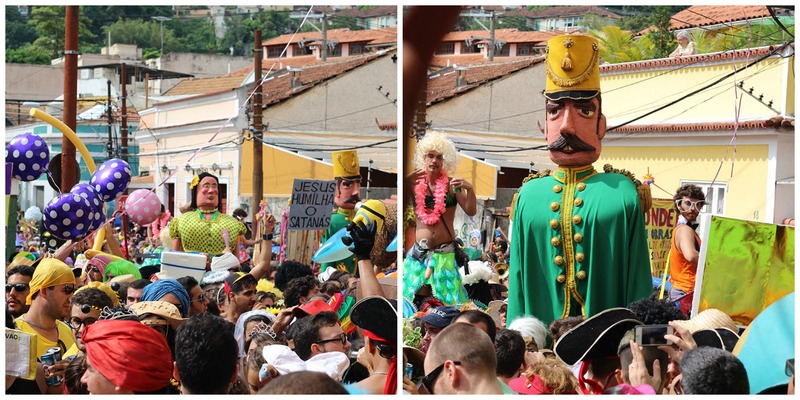 The theme: Sargento Pimenta/ Sergeant Peppers, a samba band playing the Beatles. I have reservations about such a combination: Sambarised Beatlemania?! The bus journey there is colourful. 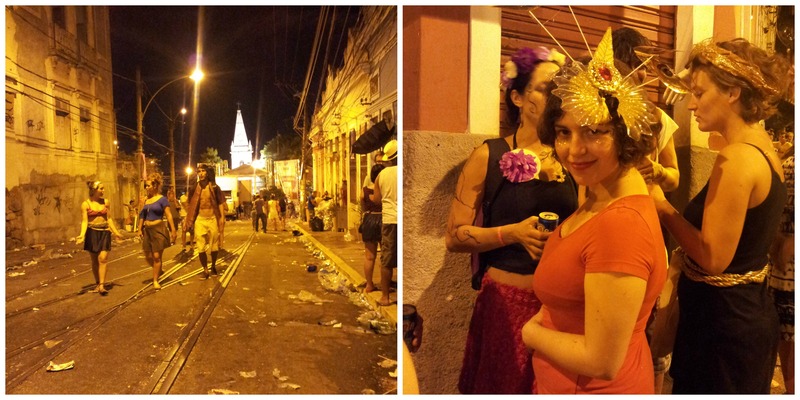 The holiday vibe is so normal now – the whole city is at the mercy of Carnaval! I’m in love with this. Parque Flamengo is expansive. Peter, Juan and I join the crowds walking along. You can´t hear the music yet but the magnetic pull of the bloco draws us in to worship. Ah-ha! As we get closer the excitable samba bateria drums call out, “…You got to admit it’s getting better, it’s getting better aaaaalllll the time….” is sounding really bloody good with the added dimension of this bossy rhythm! Oh heck! I know the words! I spent many a day as a teen gobbling my way through the Beatles back catalogue, whilst absorbed in art homework – I know ALL the words – hurrah! No more attempting to mime my though a marchinha. Despite warnings of a potential camera snatching I clutch my prized DSLR baby and snap away in the heaving crowd. More colour – more energy – more enthusiasm – with a sassy Beatles soundtrack. YES – I think this works! ……and I wake up feeling sick. Aching body, sore throat, headache. I stay in bed and wonder if this has all been a dream. I prop myself up with herbal tea and porridge and sleep and sleep and sleep. To conclude? it’s been brilliant fun. 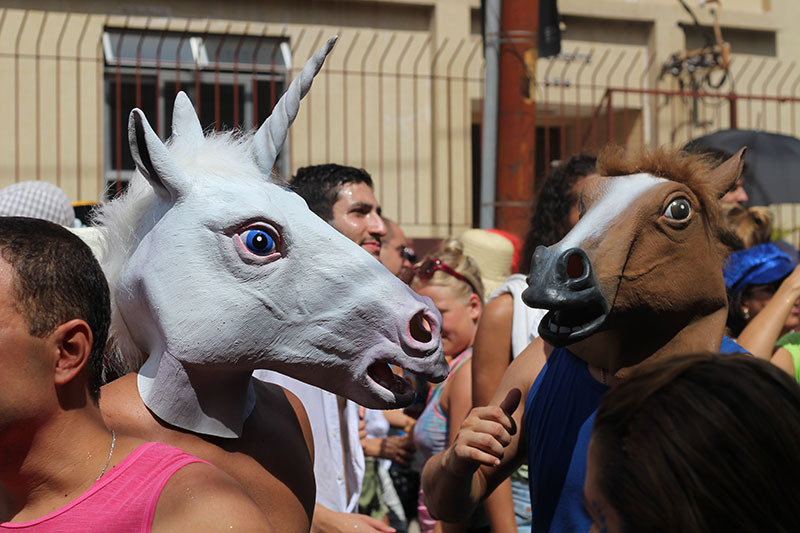 I’m already planning my return and a more ambitous costume for next year. 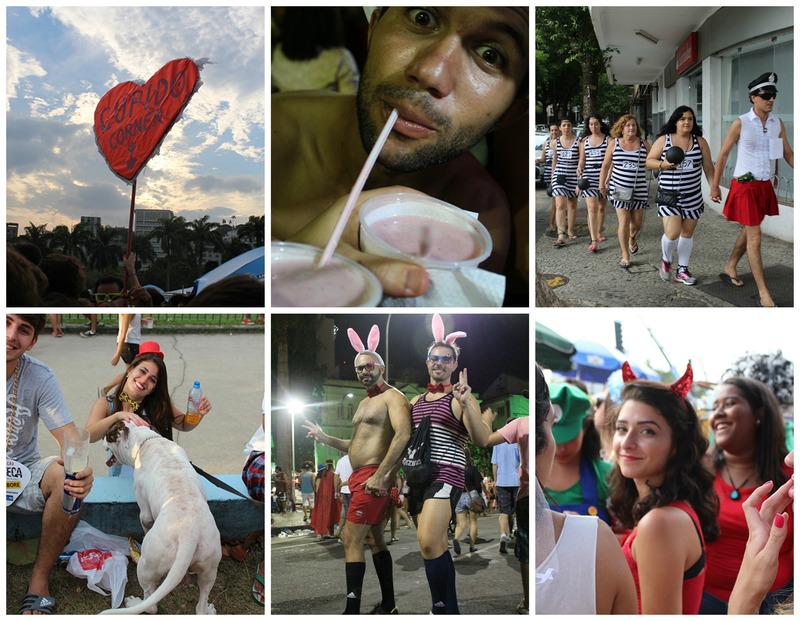 Cupid’s Corner – Misleading Vodka Smoothies – Prisoners – Carnaval Staffy – Bunny Bears. And yes, more beauty still…. There’s a Pyschedelic Storm a brewin’! 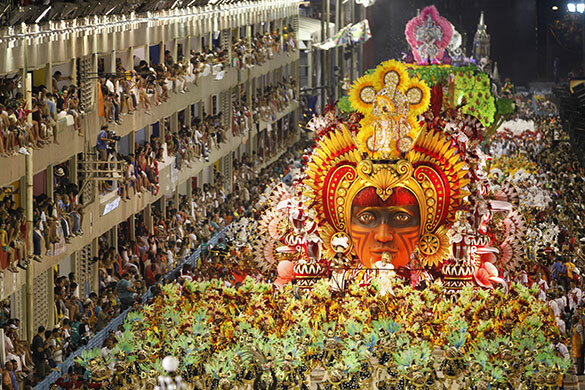 Salgueiro Samba school parade….courtesy of The Guardian. I’ve noticed this fragrant waft in the air ever since touchdown in Brasil. 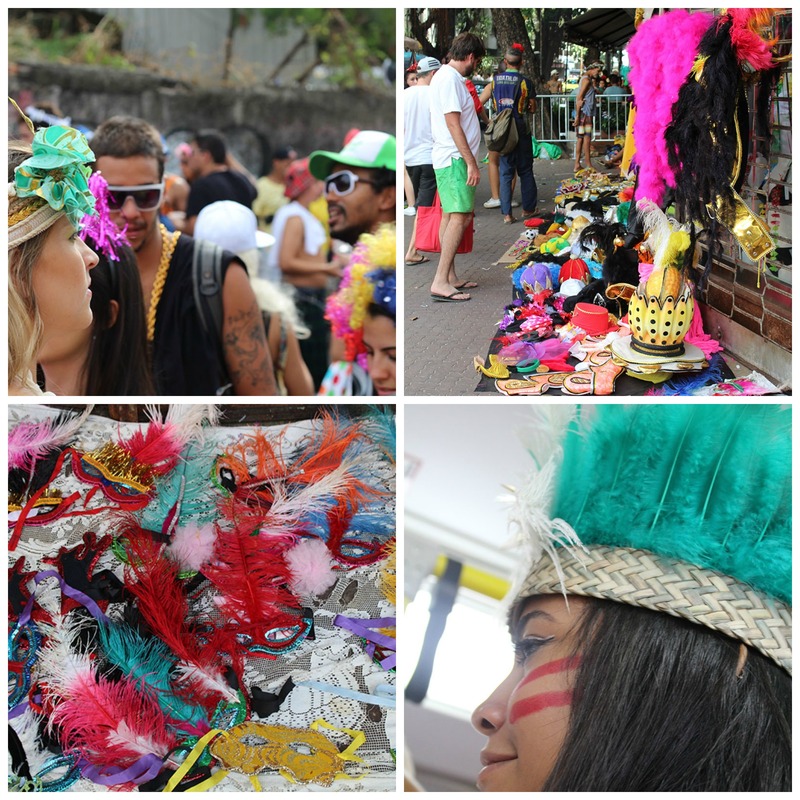 “Carnavalcarnavalcarnavalcarna….! It turns out there’s a storm a’ brewin’, a colourful one and the anticipation is palpable. Gosh, it feels so different from England where I’ve grappled for a Bank Holiday Monday like a precious extra day of freedom. This country, in contrast enjoys a lot of public holidays and dancing in the street is perfectly normal. 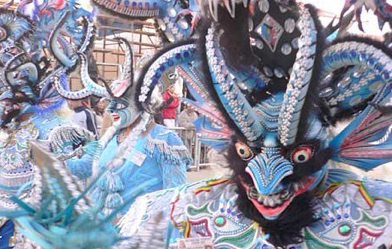 La Diablada….The Devil’s Dance, Oruro, Bolivia. Another psychedelic affair on my calendar! Apparently everyone will think me -c-o-o-l- and be surprised that a ‘gringa’ (stiff, self-concious, flat-bottomed European) knows the solo Samba foot shuffle. I join a dance class with Felipe, Flavia’s brother. This year he’s determined to master the nimble footwork and as a lindy hopper, I feel confident that I can too! 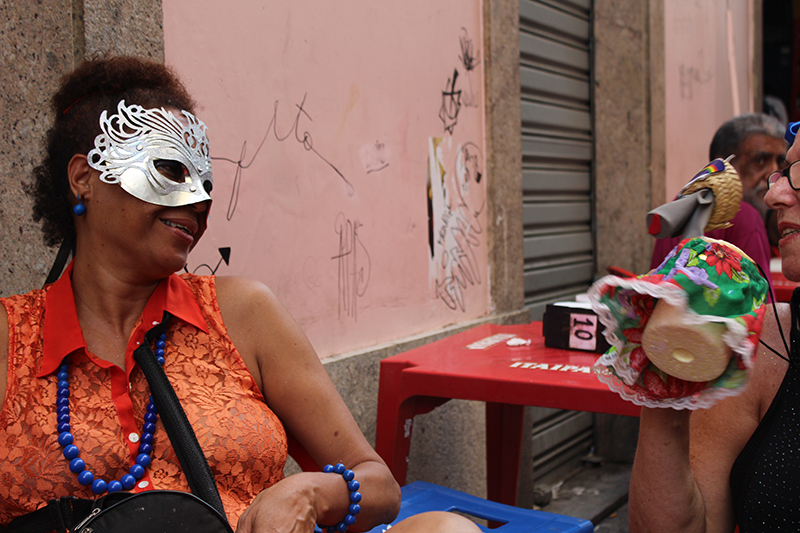 We go along to the ‘espacio de danca’ of famous Cariocan dancers, Sheila Aqunio e Marcello Chocolate on Rua Bento Lisboa. 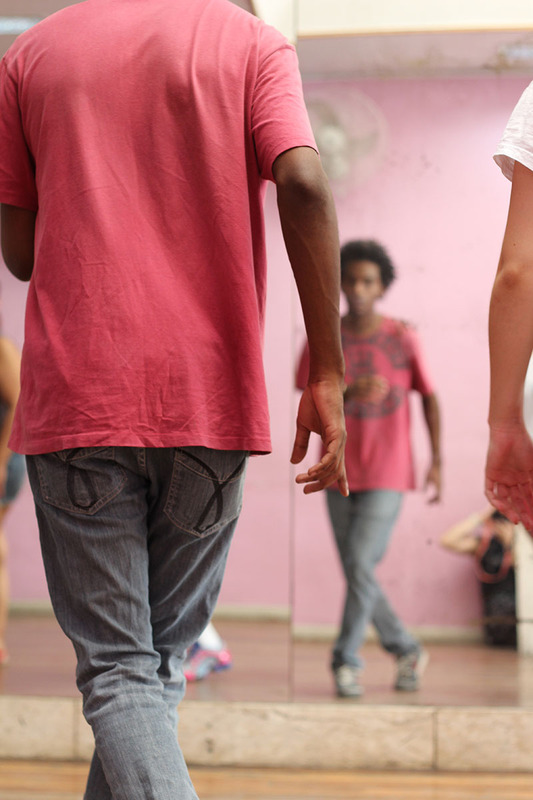 Surprising to me, dance lessons of every kind are everywhere in this city – yes – another stereotype broken: some Brasilians need dance tuition. The teacher Gabrielle tells me to keep my footsteps close to the ground, no need to bounce on my feet or swivel my legs as is the Lindy habit of my muscle memory. As a menina (girl) I dance on the front of my foot. As a menino (boy) Felipe on his heels. You push into the ground. “Um, dois, tres…um, dois, treeeees……pisa, pisa, pi—sa”. This all feels within my grasp until the tempo increases and then my style flies out of the dance school window. The samba rhythm is hard to resist, “Chik-chik-a-boom-boom”. Before I know it my feet are drumming away, my inhibition begins to lessen, I imagine myself as the smiling minx in the clip above and I’m in Samba mode! 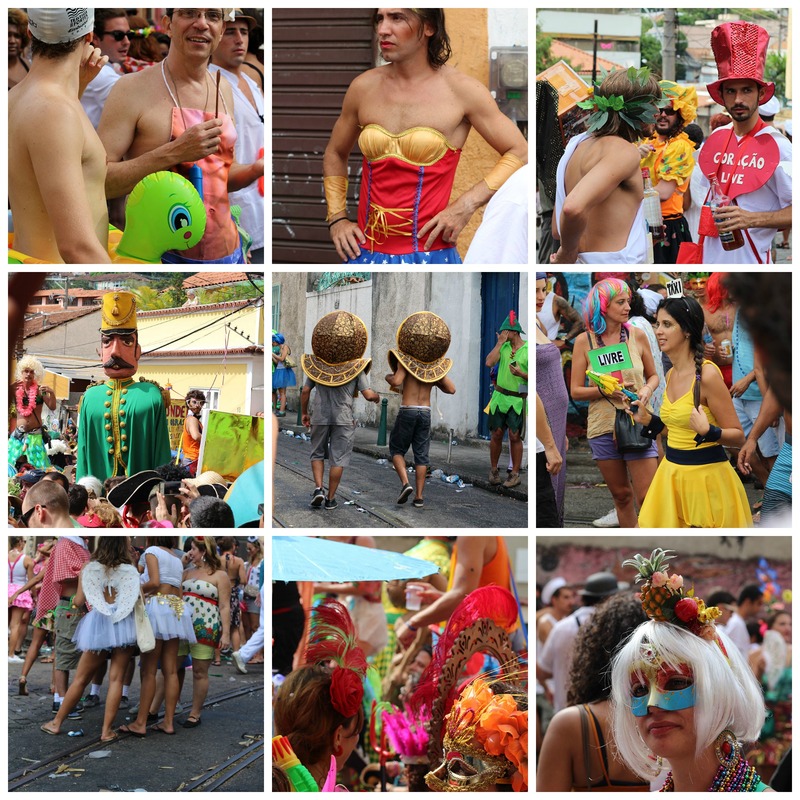 A vision of what a Carnaval street party could be is conjured up in my mind. Over breakfast one morning and in reference to my sister’s name Joy – Flavia, Felipe and their magnificent grandmother Elena try to teach me ‘Aurora’. 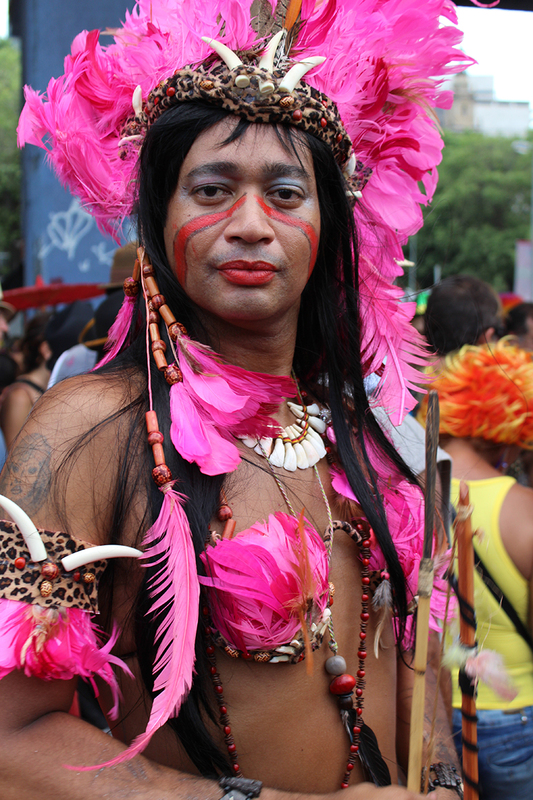 The song is a well known ‘marchinha’ sung during Carnaval. 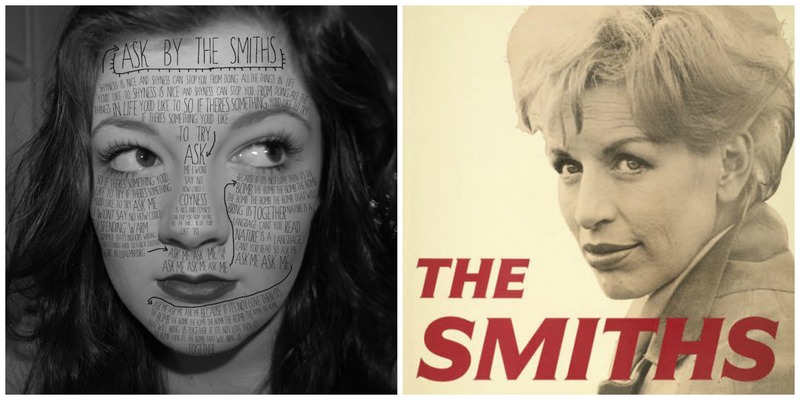 These are the traditional songs wailed by the masses – everyone seems to know the lyrics! 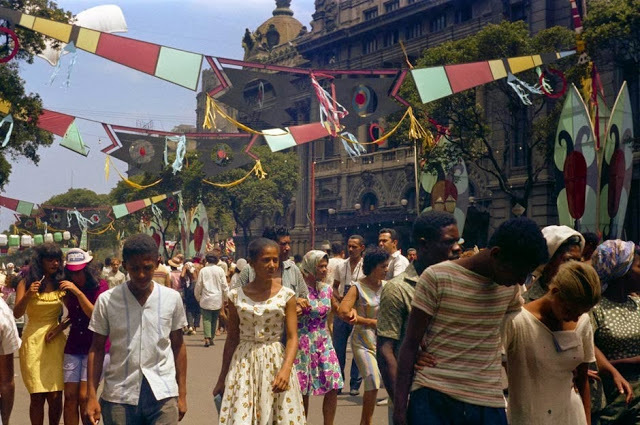 Don Elena went on to recall how quiet Carnaval became during WW2 and, in turn, the most wonderful bombastic of Carnavals when the war was finally won and families were reunited. I really enjoyed hearing her tale and it set me off on a reverie of what war time Rio may have been like through the eyes of a teenage girl. As part of getting my bearings, I hop on the Rio city Metro to Uruguiana and the Mercado Populaire to do some costume browsing. It reminds me of Camden, London – somewhere I worshipped as a teenager, going to the big smoke every now and then from Suffolk, on the train. The streets are chokka block with shops of tack, chintz, fancy dress, haberdashery, wacky glasses that glow in the dark. I coyly come away with a R$10 mask and a note taken of the best plastic flower and fruit shop I’ve ever known. 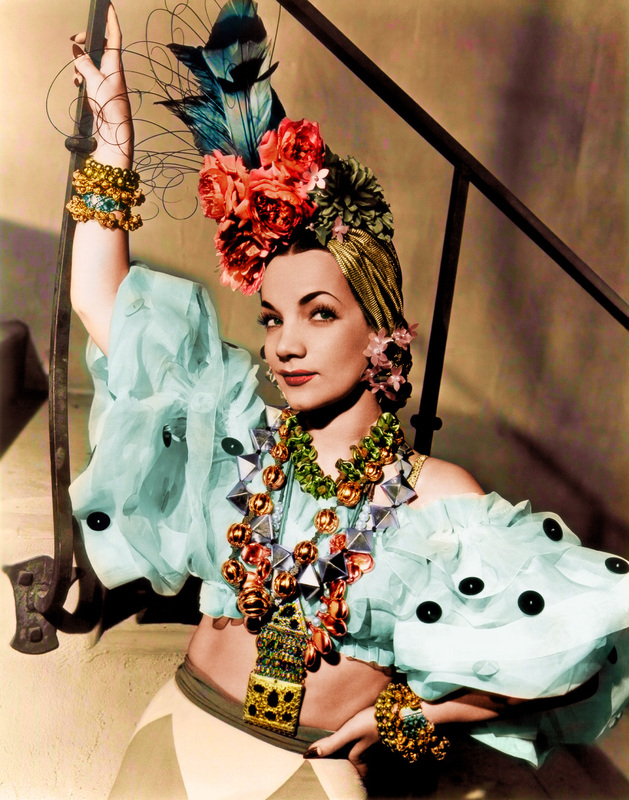 Mmmmm, at the very least a Carmen Miranda hair-do is in order! If there’s ever been an occasion to dress up and dress wild then this is it. A couple of weeks before official ‘kick-off’ I join two friends on their way to a Bloco band rehearsal in Gloria. 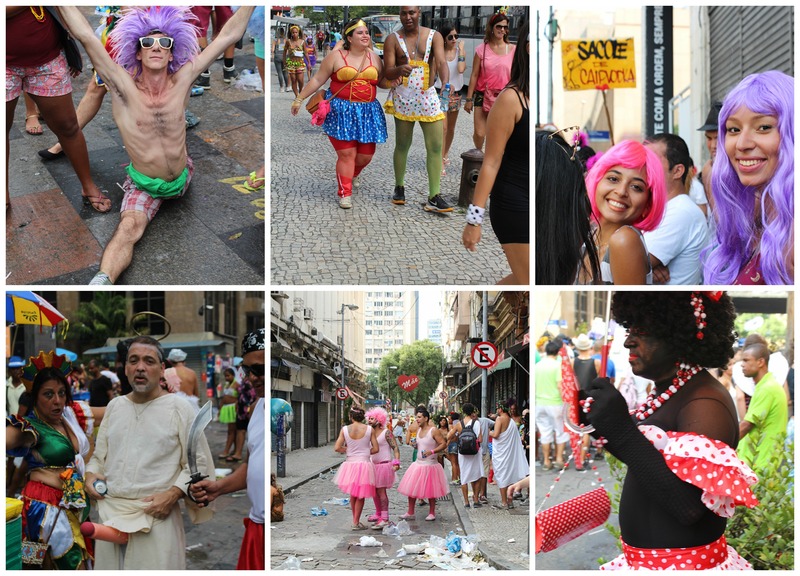 The Carnaval of the everyman is the umpteen block parties on every street of every neighbourhood of Rio and beyond, across the whole (vast!) country. From sundown to moonrise the band get going – Gloria neighbourhood. My friend, Jonathan is playing his soprano saxophone as part of the band of players. It’s all so effortless! 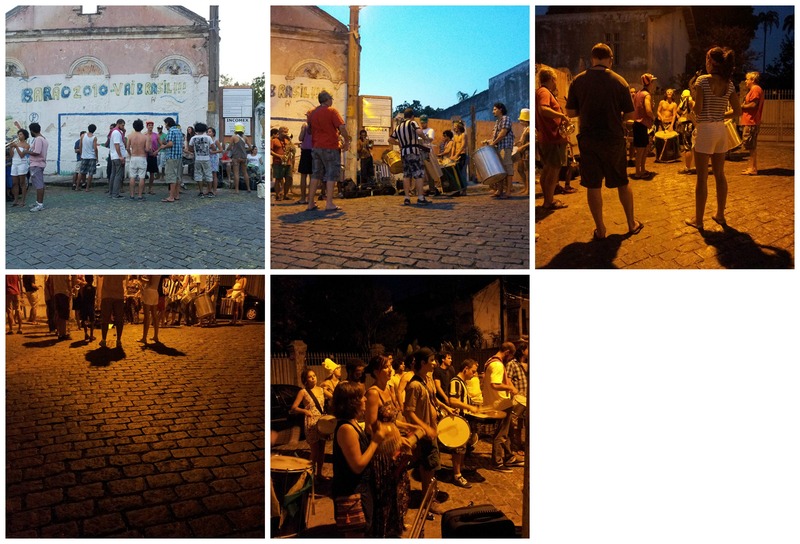 A bunch of folk play their instruments on the street, sup ice cold beer courtesy of the beer man, children run around and locals, curious about the cheerful melody bouncing off the brick walls, trickle in to enjoy the foray from their nearby homes. As dusk settles and the moon rises the atmosphere gains momentum, foot tapping turns into hip swaying and not before long, a bloco is born! 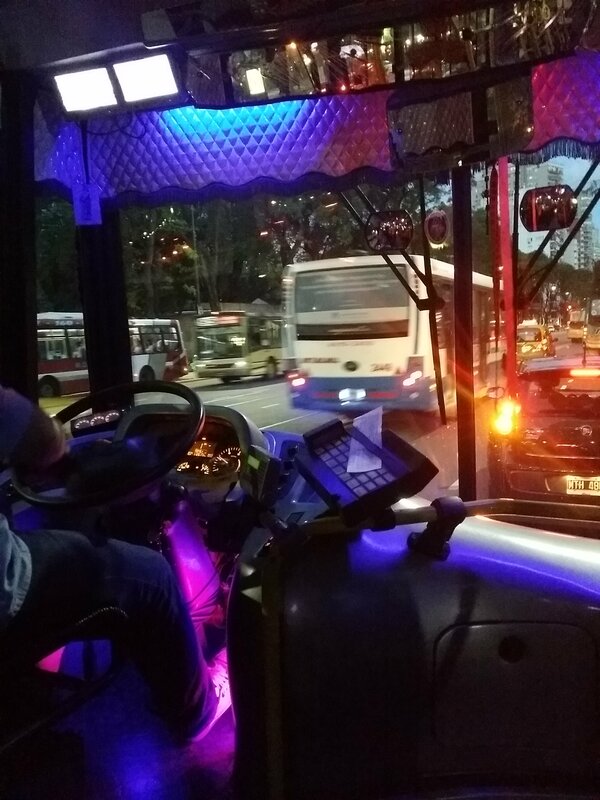 The Carnaval fragrance grows ever stronger…..
On a Saturday eve, 6 days before it all goes officially nuts and I decide to hot-foot-it to the Sambadrome to see a samba school rehearse for the parade. “How cool,” thinks I, “not a Hippodrome, but a SAMBAdrome!” It tickled me to discover this purpose-built stadium all in honour of samba and it’s not just Rio that has one. As luck would have it, I wangle a part time job within a week of my arrival at a guest house overlooking this beast of a stadium. To get in the mood for this ‘season of meat’ (carne=meat, eval=farewell to) I scurry along on a rainy night. 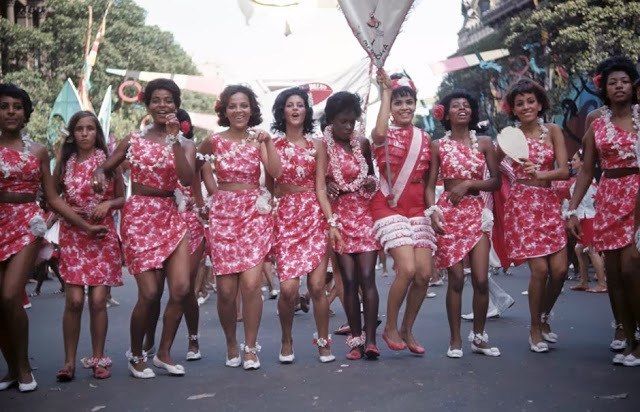 Giddy supporters of the school beckon me over, thrust a plastic cup of beer in my hand, duck under my umbrella and proceed to teach me the Beija Flor (Hummingbird) samba school chant. 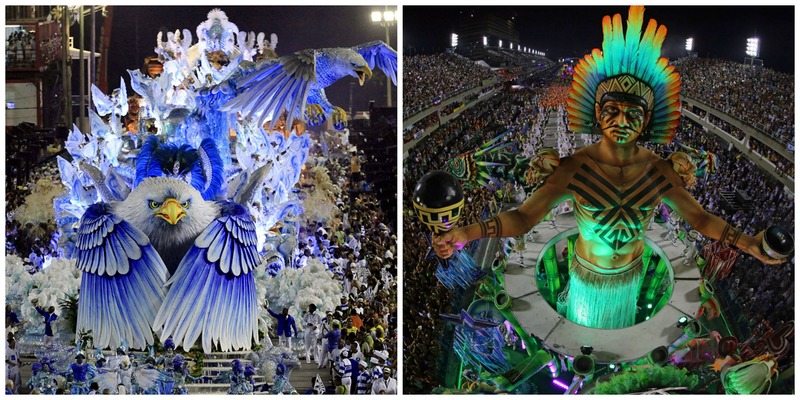 Beija Flor samba school sashay down the runway in the drizzle – full of gusto, big smiles and big costume. It’s Sunday, 5 days and counting. I go along to Oswaldo Cruz in Zona Norte (North Zone) with Marisa, a cool lady I met at a local party at L’Argos des Neves just around the corner from where I live. We take the train there and every carriage is full of revellers practising their chant. 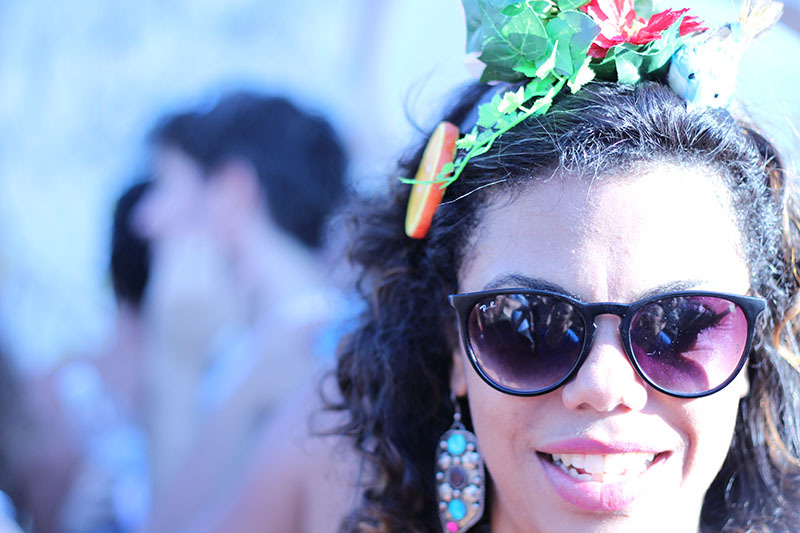 She tells me that Oswaldo Cruz is the original home of Samba and all the best dancers and schools originate from here. 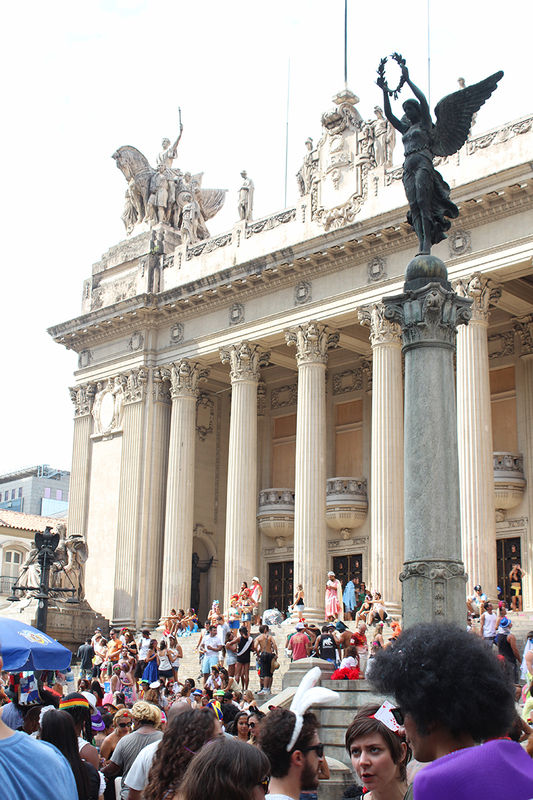 We’re here for ‘Feira das Yabas’, an originally traditional do but essentially a warm-up bloco to the official Carnaval week. The word refers to Yaba Yemanja, a feminine deity. The ‘Yaba’ or matriarchs of the community cook delicious grub that is typical African within Brasilian culture. A posse of us bundle off the train and walk through an unassuming residential area to the main street. There before us is the action – like a crazed mob from a zombie invasion – music, people and creative colourful head wear is a-plenty. The music is coming from a large float with singers aboard, gazing down from on high. The Crooners at Feira das Yabas. They serenade the heaving crowd who gaze back in adoration, arms outstretched, smiling and singing straight back. 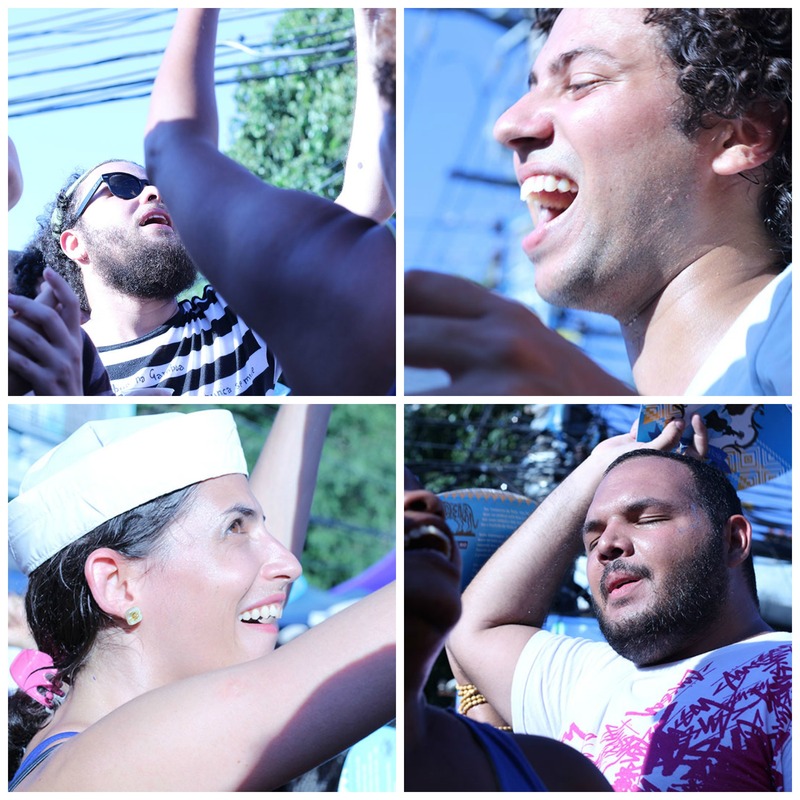 I’m told some of these singers are of cult status in Rio – Carnaval celebrities. We enter the jolly crowd and my feet begin to shuffle on the ground, along with everyone else. Beer, smiles and ‘abracos’ (hugs) are all around. I arrived here in Rio at the end of January and had the pleasure of staying with a local Lindy dancer Flavia, in Laranjeiras, a leafy part of Rio’s Zona Sud (South Zone). Lucky me I thought. 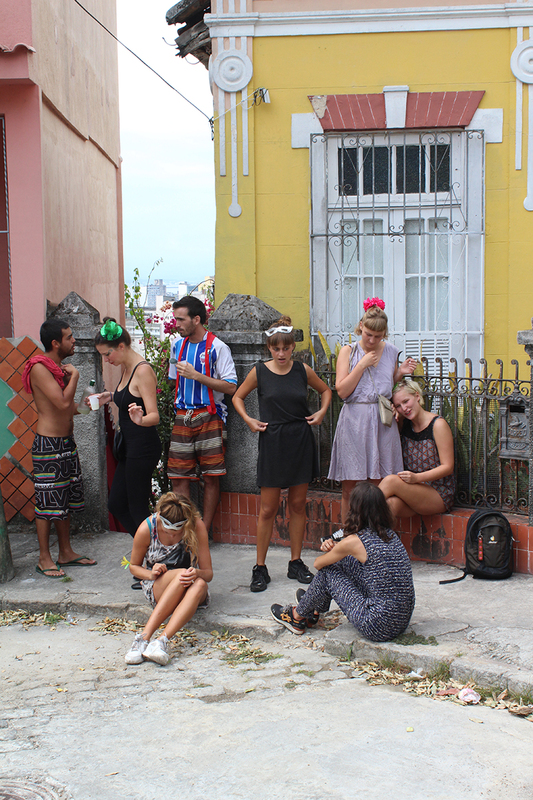 The idea was to orientate myself around this tropical metropolis and adapt to the climate, lingo, geograpghy and etiquette in the five weeks leading up to the thronging mayhem of Carnaval. Bazaar Laranjeiras on Rua de Laranjeiras! 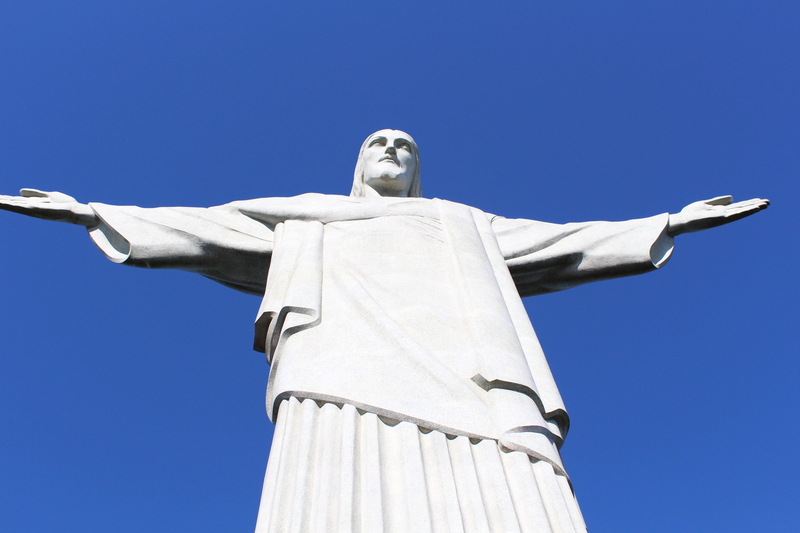 Cristo Redentor (Christ the Redeemer) – a local resident of Laranjeiras. From England I contacted Cinthia from the Rio Hoppers and she put Flavia and I in touch. Travel anywhere in the world and if there’s a swing dance scene, you’ll generally have a instant posse of pals….I might just test that theory! 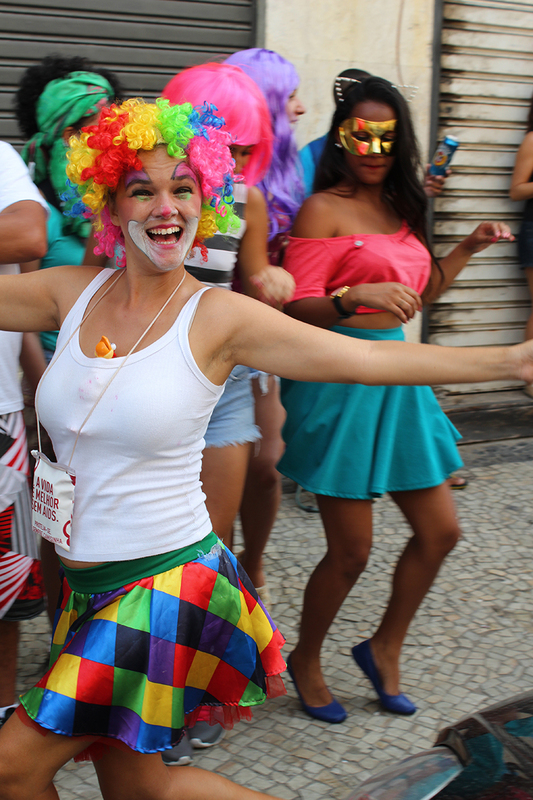 Flavia is a 24 year old dentist who has long loved dancing – such is the stereotype of a Brasilian. She began Lindy three years ago with the local Hoppers and she’s a great Samba de Gafieira dancer too according to her brother Felipe. 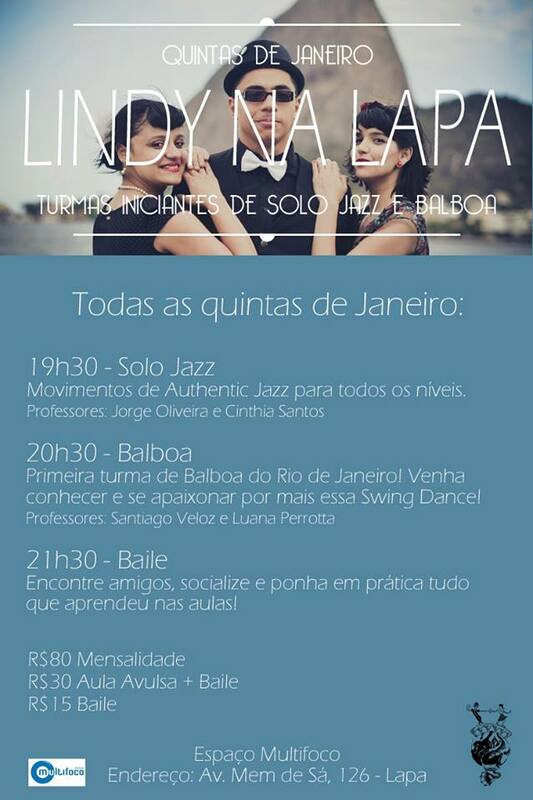 We go to Lindy na Lapa on Thursday evening and I meet the some of the movers & shakers of this city. 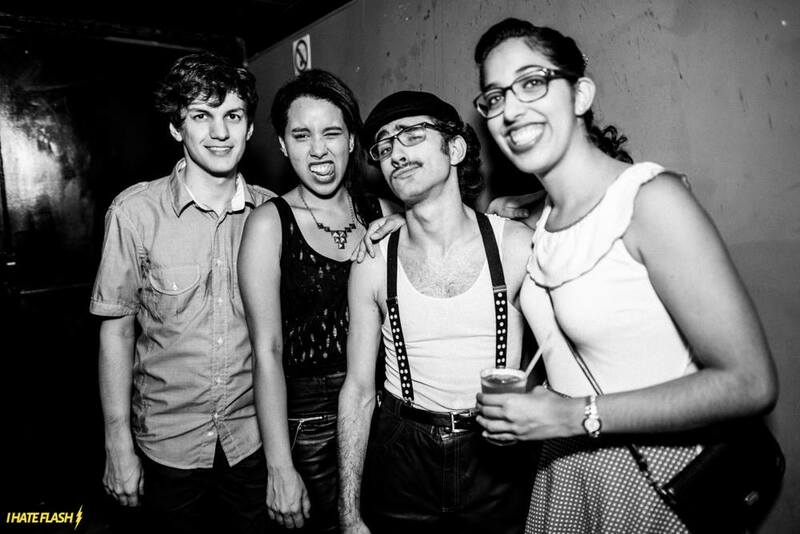 Santi, Luana, Jorge and Cinthia are full of beans, talent and vintage charm. They launch themselves into a lesson of the Tranky Doo and the class of mixed abilities follow like a bunch of young pups. It’s so good to hear this music in Rio! and I feel instantly at home. 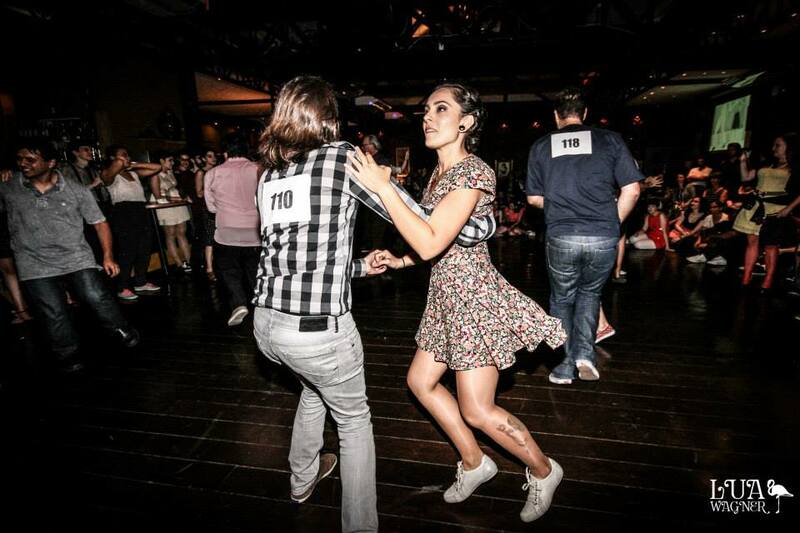 A couple more regular Lindy Thursdays later and I’m getting to know Nico from Argentina (who misses the Buenos Aires scene); Gabriella who first tasted Lindy hop in Leeds during a year of study there; Luiz, Joy, Thais, Gido – a vivacious dancer if ever I’ve known one! – and Ana, who’s sporting some super high waisted shorts (like Hen’s teeth to find in Rio, grrrr…!). I also meet Paolo who tells me bluntly that I need to wear more deodorant, ha! Pretending not to care I blush, and take heed, oh goodness! The core Hoppers meet weekly to compose and practise choreographed routines. 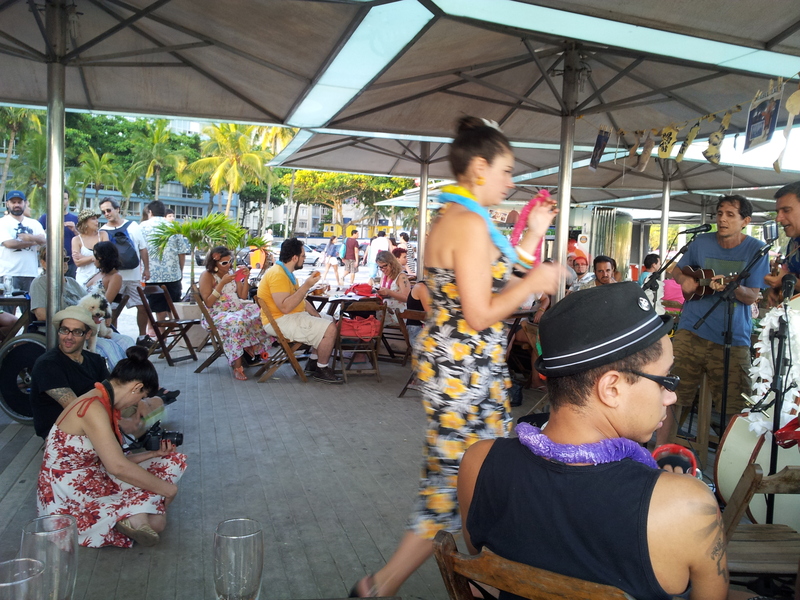 They treat Rio to flash-mobbery every now as well as regularly performing at Manie Dansante, a roaming club night of vintage delight led by the best Latin American electro swing DJs. From small coconuts big palm trees grow! As the days turn into weeks I learn, through hearing tales from the gang, how Lindy hop has found fertile soil here in Rio. 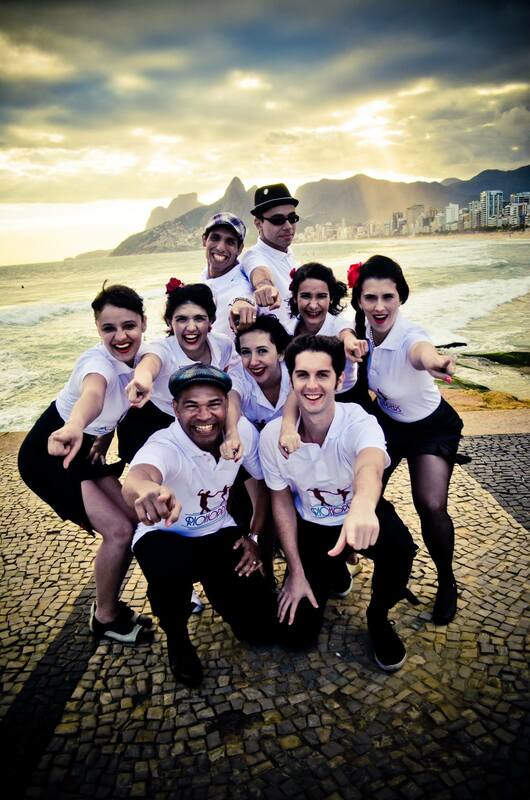 A Carioca, Flavia and American student, Ese started a class…from which grew a troupe…fast forward to 2011 when the Brasil Swing Out Extravaganza was born – yeah! 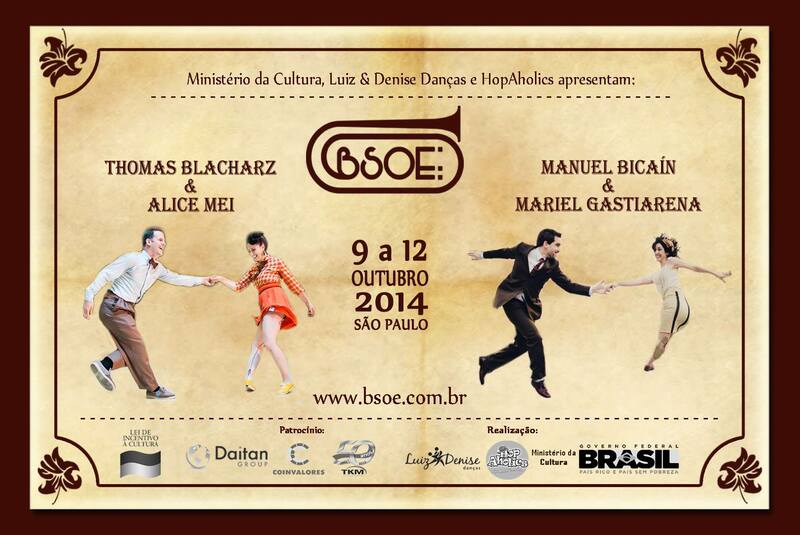 Alternately shared between Rio and Sao Paulo as host cities, BSOE is an annual Lindy festival of non-stop dancing. 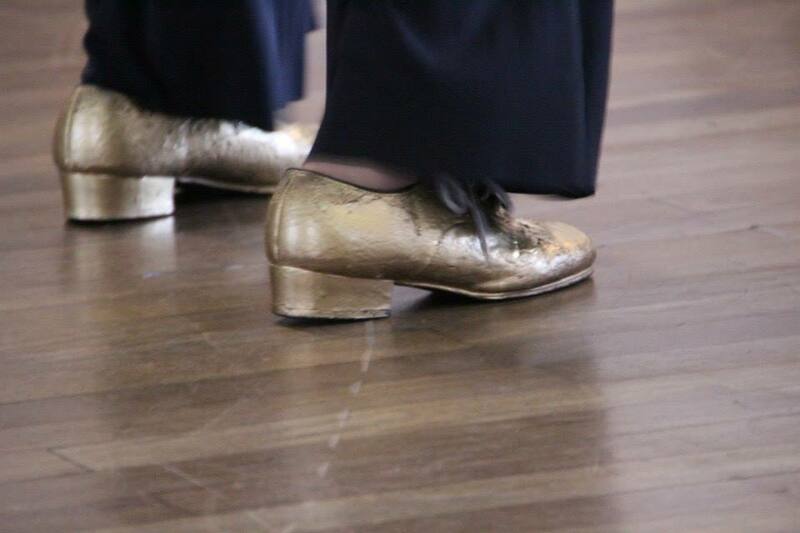 Now in it’s fourth year, they bring in international teachers (Kevin St.Laurent and Jo Hoffberg in 2013) and last year Lindy veteran and performer, Dawn Hampton – wearing some really cool shoes. 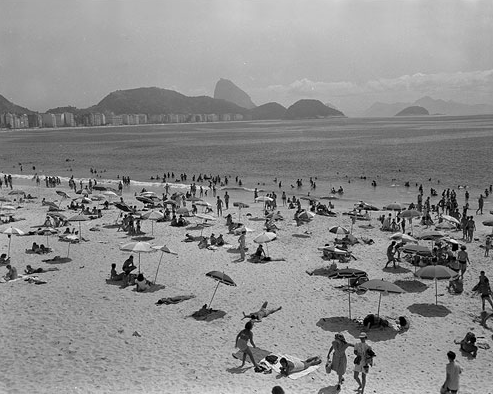 It’s Sunday and I travel across the city to Leme, near Copacabana for Lindy na Praia – Lindy by the Beach. Woweee – this is a tiki style heaven. 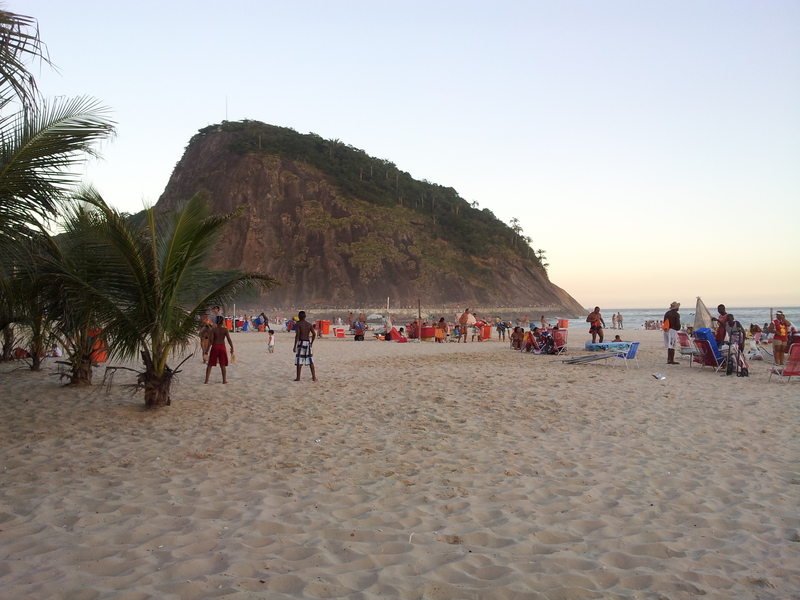 It’s early evening and the beach is cooling down, families all warm & sleepy from the hot sabbath sun. 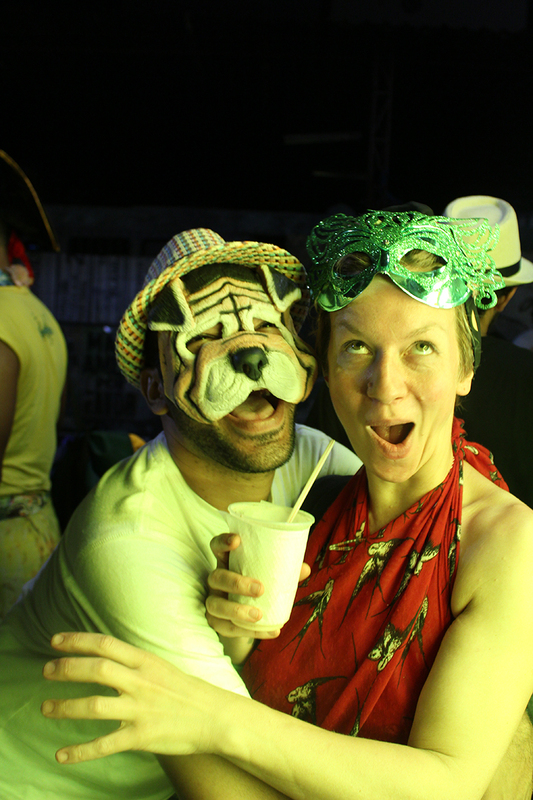 I sip ‘agua de coco’ and enjoy ukulele music from the Digga Digga Duo. Some wear 1940s style swimsuits that go against the grain of the ‘Almighty (and extremely small!) 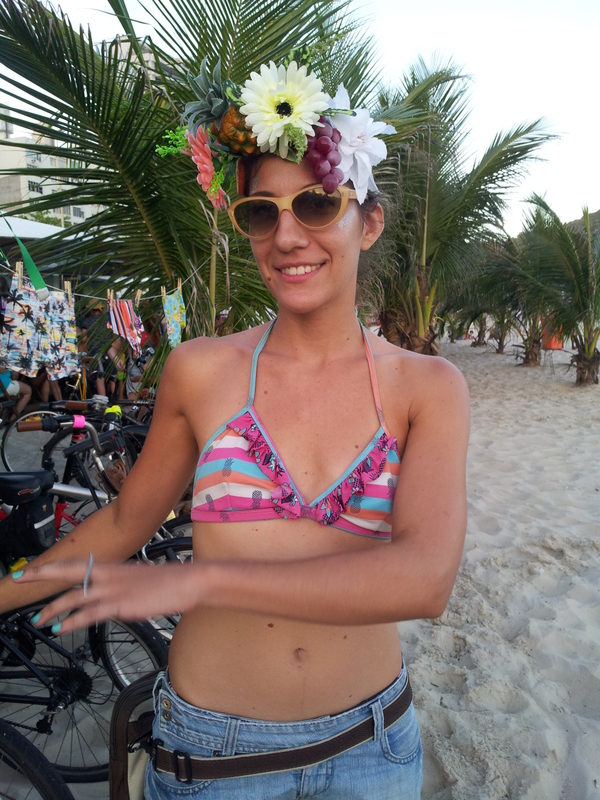 Brasilian Bikini’. Nico tells me I have to work on my swing out. It’s all a humbling experience being here – speaking baby Portuguese and, as it turns out, having my bad dancing habits revealed to me. I remind myself: this what I was looking for. 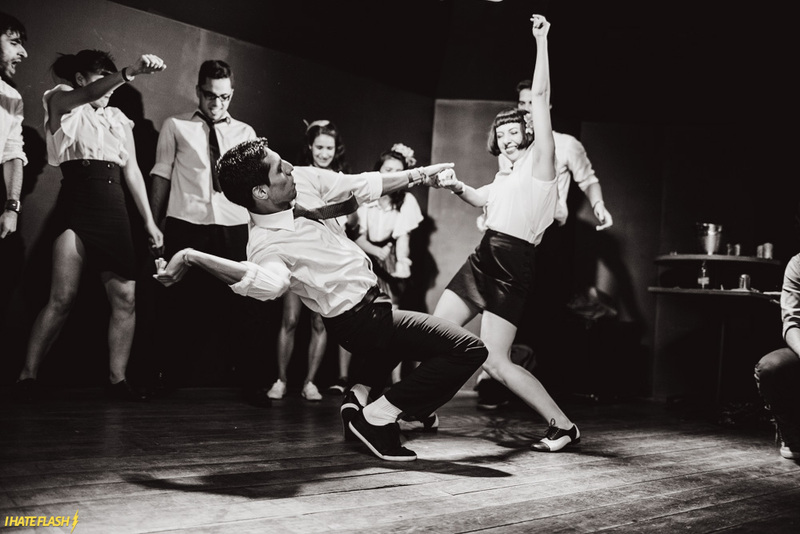 A step out of my comfort zone and to see how Lindy hop is evolving beyond the shores of England. Afterwards we go for ‘choppis’ (draught beer) and fritas Portuguese. I meet Paola, whose first priority on moving to Santiago, Chile in a few days was to check out the Lindy scene. 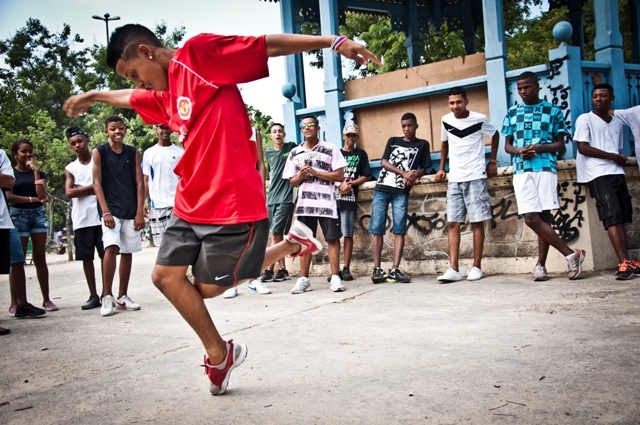 I learn about Passinho, an incredible dance evolved from the favelas, via Jorge. 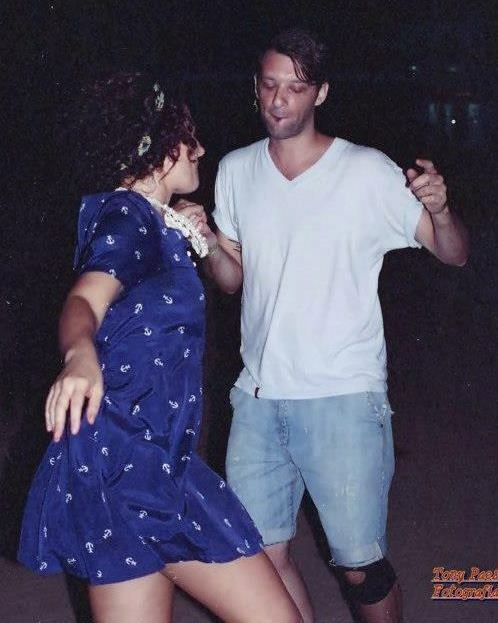 Together we compare stories of our first Lindy hop memories and that same familiar bright-eyed expression of wonder bounces across our faces like a Mexican (Brasilian?!) wave! If ever there were a healthy addiction then this is surely it. Feeling a little deflated due to ‘social dance withdrawal syndrome’ I receive a word-up from Gabriella about Indie Lindy. She must be psychic! She and other Lindy lovers in the city want to dance more (yes!) share and practice together more (yes!) and all for FREE (yes please! says my meagre backpacker budget). So I go along to the first of many a regular Wednesday night in a mirrored studio in her apartment block. A small group of us dance, laugh, offer a critical eye when needed and end our evening taking away new moves. Such delight! We round off a happy night with Acai cremosas (a mildly sweet berry slushie – serious heaven and unique to Brasil) on our way to a bar where we banter until the early hours under the light of a starry urban sky. Indie Lindy saves the day!